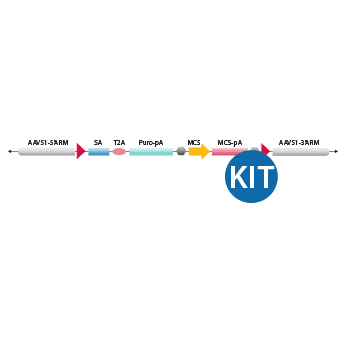 Get the critical reagents for knocking-in any gene or promoter-gene combination into the AAVS1 Safe Harbor Site with this Kit that bundles together an HR Donor—the AAVS1-Targeting All-purpose HR Donor Vector 2.0 AAVS1-SA-puro-MCS—a Cas9/AAVS1 gRNA delivery construct—the All-in-one Cas9 SmartNuclease & AAVS1 gRNA Plasmid—and a 5’ and 3’ primer mix for a Junction PCR Assay to verify integration into the AAVS1 site. Our second generation, All-purpose HR Donor Vector 2.0 AAVS1-SA-puro-MCS is a promoterless construct enabling knock-in of any gene or promoter-gene combination into the AAVS1 site. Like all of our AAVS1 HR Donor Vectors, it come with AAVS1 homology arms already cloned in, simplifying your workflow. Just ligate-in the gene or promoter-gene combination of your choice and co-transfect with the included All-in-one Cas9 SmartNuclease & AAVS1 gRNA Plasmid. You can verify correct insertion with the included 5’ and 3’ Primer Mix for Junction PCR Assay.